I am the developer of Smart Wi-Fi. After majoring in software engineering at university, I developed embedded Linux device drivers and multi-platform middleware in the semiconductor fabless industry for three years (2008 to 2010) and developed Wi-Fi apps (OEM for Samsung) and Android platform porting for three years from 2010 to 2012. One of the many projects I have worked on for the past five years is called Smart SIM. This was a very innovative project that aimed to embed the Android platform at the USIM and control devices of mobile phones using USB I/F. Can you imagine changing your mobile phone to an Android smartphone or a Windows mobile phone simply by changing the USIM? Unfortunately, the project had many issues including the bandwidth and reaction rates of USB I/F. The idea was commercialized through 2010 MWC, and then soon died out. I have introduced this project to share my experience. I analyzed and ported Wi-Fi Chip Driver (Atheros ar6xxx), wpa_supplicant, dhcp and Android Wi-Fi Layer while separating the Android Wi-Fi module during the project. 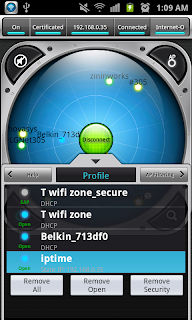 In other words, I gained experience and expertise by analyzing all Wi-Fi software for Android. Smart Wi-Fi was developed based on these experiences, and I have a strong commitment to this app because it is my first app. Its convenient functions set it apart from previous Wi-Fi apps, and the smooth U/I completed with game graphics will enhance the convenience of your experience. I promise that I will continuously provide updates to make Smart Wi-Fi a world-class app, with maximum convenience and excellent functions. 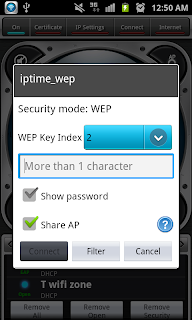 Key Index Settings are available when connected to AP in WEP mode. Static IPs by AP allow quick accesses to APs with weak signals or connection problems. Smart Wi-Fi automatically saves the IP address recently connected via DHCP. A user may use the saved IP address. [Notes] If the AP is not for exclusive use, please ask an administrator to static IP . Select an AP profile in the Profile Management menu. Select IP Settings -> Static IP in the Profile Dialogue screen. Check the Static IP Settings, edit if necessary and then click the Okay button. Auto 3G Conversion is the function to instantly convert to 3G or 4G when the handset is connected to Wi-Fi but the Internet is not available due to poor signal strength. This function maximizes convenience for Internet users. To use this function, “Auto 3G Conversion” must be checked. Wi-Fi is automatically turned off to save power when a certain period of time passes without a Wi-Fi connection. 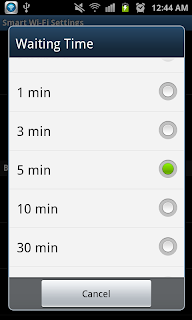 Select the standby option in Settings -> Auto Wi-Fi Off. When the time selected at the standby option elapses without a Wi-Fi connection, the message “Standby time expired. 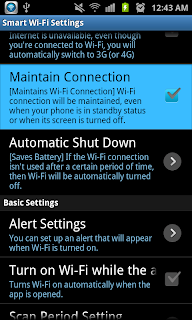 Wi-Fi is deactivated,” is displayed, and Wi-Fi is turned off. 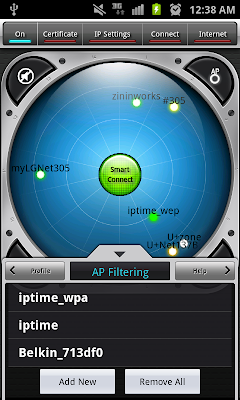 A user may filter APs that he or she will not use by using the AP Filtering function. Filtered APs are not displayed on the Radar View screen, and are excluded from the connection targets. 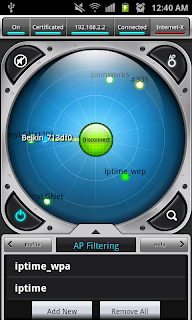 A user may deactivate the AP Filtering function by deleting the APs at the AP Filtering menu at the bottom. * It is recommended to filter the APs of other telecom service providers to enable the more convenient use of Smart Connect. 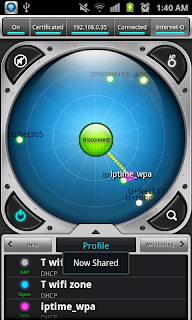 The profile is the list of data on APs to which connection attempts have been made, regardless of whether the connection attempt was successful. 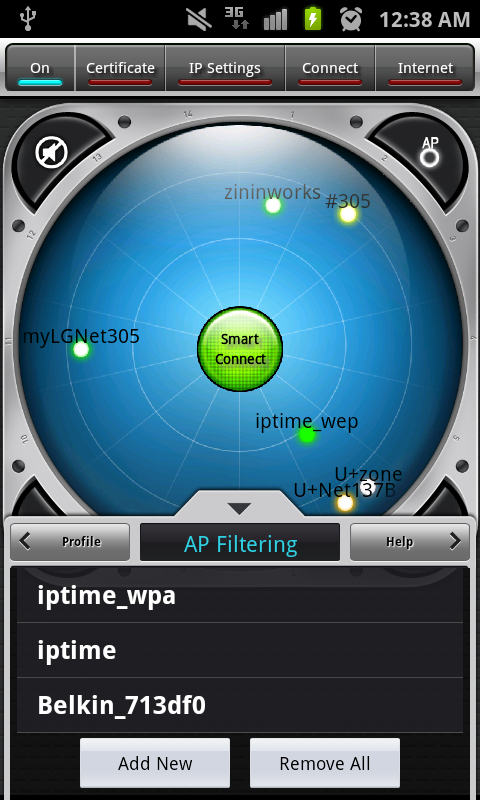 The profile is created when a user tries to connect to an AP or has successfully connected to an AP using Smart Connect. e.g. 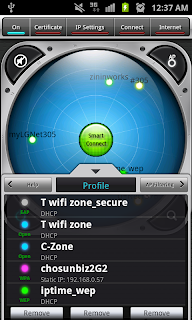 T Wi-Fi Zone and NESPOT are pre-installed profiles according to the telecom service provider of the user. In addition, the Delete All function may be provided, according to the security mode of the profile. Click the Smart Connect button. 1. When there is no available AP except for security-locked APs, Smart Wi-Fi requests the Wi-Fi Donkey server to search for available security-locked APs. 2. 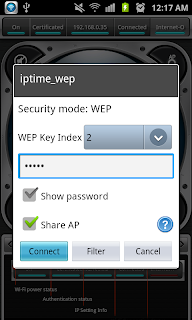 If there are available security-locked APs, Smart Wi-Fi receives data for connection and automatically tries to connect to the APs. * To use the Wi-Fi Donkey function, one or more security-locked APs shall be shared. * Connection data including the password is not disclosed to the beneficiary. * A user may activate the Wi-Fi Donkey function at the Settings menu, and GPS is activated to use the Wi-Fi Donkey function. * Access to the 3G network is required to use the Wi-Fi Donkey function, and data service fees may be charged according to the rate system. 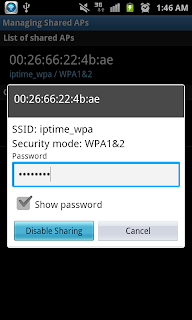 Check “Security-locked AP Sharing” option, enter the password and click the “Connect” button. After being connected, the message “AP was successfully shared” is displayed. Enter the password of the AP and deactivate sharing. Check whether the AP for which sharing has been deactivated is displayed on the list of shared APs. 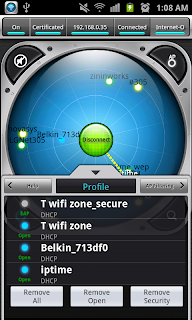 As explained in the Smart Connect section, which was covered as the second item of Smart Wi-Fi functions, a user may use the Wi-Fi Donkey function. 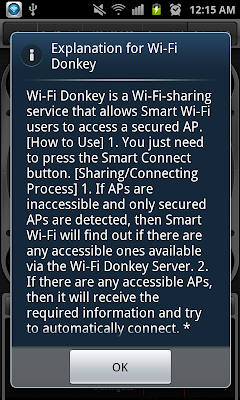 When there is no available AP, a user may request data to connect a security-locked shared AP to a Donkey server. The server enables the user to access a shared AP if a shared AP is available.